Description: Level / Audience: Anybody who is interested in organic food, sustainable organic farming, living, mobility and building. 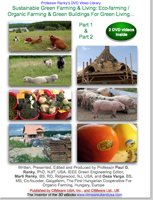 This DVD set will be enjoyed by high school students, technicians, undergraduate and graduate engineers, architects, agricultural engineers, managers and policy makers, farmers, scientists and managers. Sponsors/ Contributors include with special thanks to Ancient Harvest Quinoa, Aromatica Organic Spices, Bob’s Red Mill, Earthbound Farm, Green & Black’s, Lapas Olive Oil, Lundberg Family Farms, Morton & Bassett Spices, Muir Glen, New Morning, Organic Valley, Sky Top Farms, Sunfood Nutrition, 365 Organic, Whole Foods Market, CIMware Ltd. UK, CIMware USA, Inc., Mick F. Ranky for location management, Geza Varga, BS, MS, Co-founder, Galgafarm, The First Hungarian Cooperative For Organic Farming, Hungary, Europe, USDA, Washington DC, USA, and others. Contents: This is a DVD video combo pack. Part 1 begins with a video presentation by Marti Ranky, BS, RD (Registered Dietitian), Ridgewood, NJ, USA on what is organic vs. conventional farming through the application process of how to become an organic farmer in six steps. Then she discusses the differences between organic and non-organic produce with several practical examples. The benefits of organic food considering, nutrition, pesticide levels, taste, environmental impacts, humane considerations and price are also examined. Part 1, and Part 2 carries on with an exciting visit to the First Hungarian Cooperative For Organic Farming, in Hungary, Europe. Geza Varga, BS, MS, Co-founder of Galgafarm, based on his 20+ years experience explains their solutions to sustainable, green, organic farming, living and building. During the discussion with Dr. Ranky, parts of the working Galgafarm are visited, including the animal farm, some of the fields, as well as the eco-village. Some traditional sustainable green fabrication methods are demonstrated in detail in buildings under construction, as well as finished family homes are visited. Disclaimer: Please note, that all opinions expressed in this program are the presenters' personal opinions, based on their own judgement, and have no reflections on any other party. System Requirements: DVD-video: NTSC standard definition (SD) DVD video player for TV, or computer. Approximate length Part 1 = 40, and Part 2 = 30 mins, in 16:9 widescreen format, also playable on a 4:3 regular screen, or any good computer screen (800 x 600 resolution, or better). Furthermore available in PAL DVD video, in streamed digital, and Apple Video iPod formats for mobile devices. Also available in HD (high-definition) format. Please visit on the web www.cimwareukandusa.com for available formats, and further relating titles & products. All trademarks acknowledged.